Gov. 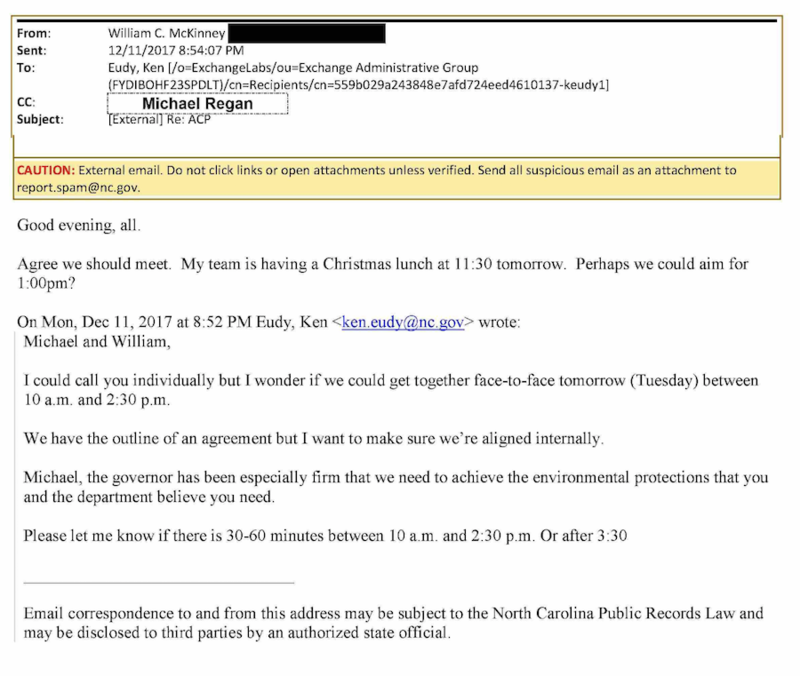 Roy Cooper and Secretary of the Environment Michael Regan discussed a controversial agreement with Dominion Energy about the Atlantic Coast Pipeline, but in a review of the first 1,854 pages of a public records request, there is no evidence of a pay-to-play agreement for a key water quality permit. However, there are 17,000 documents to go. The information was included among the more than 19,000 pages of documents that Gov. Cooper’s office provided to lawmakers, the media and other records requesters yesterday at 5:30 p.m. The media and some environmental advocates had requested the records 10 months ago. This fall, lawmakers formed a Joint Government Operations subcommittee, which, after several attempts to informally get records from the governor, filed a formal public records request. The subcommittee also hired Eagle Intel, a private firm of three former special agents — one FBI and two IRS — to investigate the governor’s office and the circumstances behind the MOU. In a letter, Gov. Cooper’s office told lawmakers earlier this month that the records would be provided by Dec. 20. A year ago, on Dec. 11, 2017, Ken Eudy, senior adviser to Gov. 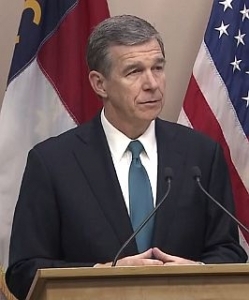 Cooper, asked to meet with Regan and William McKinney, the governor’s legal counsel, about an “outline of an agreement” — the Memorandum of Understanding. That MOU, which is non-binding, established a voluntary $57.8 million fund to boost economic development and renewable energy projects in the eight counties along the 160-mile route through eastern North Carolina. The governor, not the legislature, would have ultimately decided how the money was spent. “I want to make sure we’re aligned internally,” Eudy wrote to Regan and McKinney. Regan was concerned about the environmental damage — to waterways, wildlife habitats and forests — that pipeline construction could cause. The permitting process for all aspects of the ACP had been lengthy. DEQ had repeatedly asked Dominion, which co-owns the ACP with Duke Energy, for more information before ultimately granting the water quality permit. “Michael, the governor has been especially firm that we need to achieve the environmental protections that you and the department believe you need.” The MOU went through several drafts; at one point, the fund figure was $80 million. The governor’s office publicly released the final MOU on Friday Jan. 26, 2018, at 12:53 p.m. — just 21 minutes after DEQ had announced it was granting the water quality permit. The timing proved to be problematic. It immediately stoked suspicions among environmental advocates and Republican lawmakers — a rare alliance — that the fund was essentially payment for the permit. Assistant Secretary of the Environmental Sheila Holman also told lawmakers she didn’t know about the MOU. None of the emails included in the first 1,854 pages was sent to either Culpepper or Holman. The only DEQ leadership involved in these emails was Regan and Deputy Secretary Doug Heyl. The governor’s office, though, did know the timing of DEQ’s permit approval. Communications Director Sadie Weiner and Deputy Chief of Staff Julia White edited the DEQ press before it was released. A private firm formed by three former federal agents will investigate Gov. 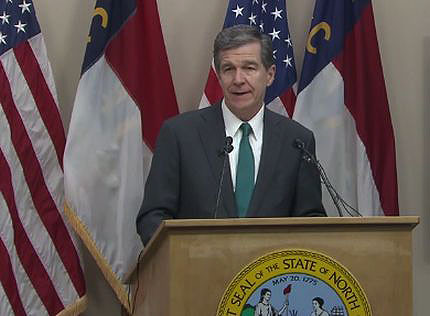 Roy Cooper’s controversial memorandum of understanding with Dominion Energy over the Atlantic Coast Pipeline. At a subcommittee meeting today, lawmakers announced they had hired Eagle Intel, based in Wilmington, to conduct the investigation. The firm, composed of Frank Brostrom, Tom Beers and Kevin Greene, incorporated last year. 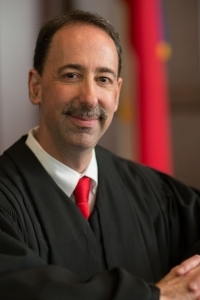 Brostrom worked for the FBI, and Beers and Greene for the Internal Revenue Service. Their areas of expertise focused on tax evasion and financial and political corruption, as well as organized crime and terrorism cases. This is not a criminal probe, but a civil one, prompted by legislative oversight, said Sen. Harry Brown, a Republican from Onslow County. The firm charges $100 an hour for its services, but until the investigation is under way, it’s unknown what the final cost will be. Under the non-binding MOU signed by Cooper and Dominion nearly a year ago, the Virginia-based utility and Duke Energy, co-owners of ACP, LLC, would pay $57.8 million for economic development and renewable energy projects along the 160-mile route through eastern North Carolina. The announcement of the MOU coincided by just hours with the Department of Environmental Quality’s granting of a key water quality permit for the project. Republican lawmakers then introduced and passed House Bill 90, which funneled the money away from its original purpose and toward public schools in the affected counties. However, no money has been disbursed yet. The Federal Energy Regulatory Commission has not issued its final construction permits for part of the route in North Carolina, which would trigger half of the amount to be due. The other half of the money would be payable when the ACP is completed. That could take years. Last week, a federal appeals court halted all construction on the 600-mile pipeline over US Fish and Wildlife’s questionable assessment of the project’s potential damage to endangered species. DEQ and the governor’s office have denied working in tandem on the timing of the permit and the MOU. But Republican lawmakers want Eagle Intel to determine if the MOU involved “pay-to-play” — that the voluntary monetary contribution smoothed the way for the water quality permit. Sen. Floyd McKissick, a Durham Democrat on the panel that hired Eagle Intel, said the governor’s office and DEQ are expected to provide documents by Dec. 20. “I think it’s premature to investigate,” McKissick said. But the governor’s office, as if to say, “touche’,” filed its own records request with lawmakers. In a document dated today, Dec. 12, Kristi Jones, the governor’s chief of staff, formally asked for voluminous information that could reveal whether Republican lawmakers’ concerns are legitimate or merely a power play. Among the governor’s request is communications among legislators, staff and any third parties, including the state Republican Party, executive director Dallas Woodhouse and chairman Robin Hayes. “We will follow where the facts lead us,” Brostrom said. According to voter registration records, Brostrom and Greene are registered Republicans; Beers is unaffiliated.